There was some serious star power in the East Room of the White House Tuesday and it had nothing to do with politics. 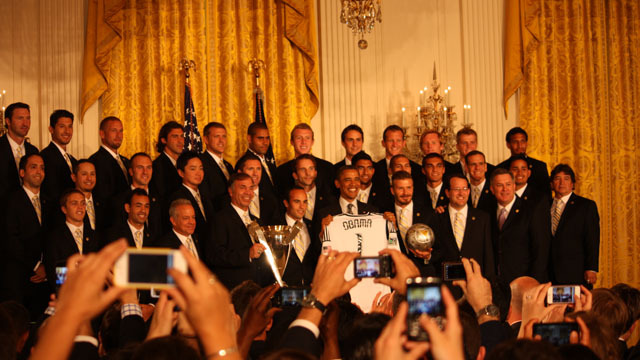 The Major League Soccer champion Los Angeles Galaxy including star players David Beckham, forward Robbie Keane, midfielder Landon Donovan and their team mates were honored by President Obama and dozens of young soccer fans invited to the White House. Calling them the "Miami Heat of soccer" the president commended the team for their success. "[T]ogether you pulled off one of the toughest feats in team sports: You lived up to the hype. You combined star power, hard work; it paid off." The president poked a little fun at David Beckham telling the 36 year old, "I said half his teammates could be his kids." "We're getting old, David. Although you're holding up better than me," the president laughingly told Beckham. But he thanked the team for agreeing to stay and talk with children invited to the White House to meet the players. "As a soccer dad, I know you've inspired a lot of kids. And today you're giving them an experience that they will never forget," the president told them. After the East Room event, the players joined Michelle Obama and about 60 children invited for the event in the State Dining Room as part of a Let's Move program, the first lady's initiative to instill healthy eating habits in children. Mrs. Obama said she hoped to hold a soccer clinic outside on the White House lawn but rain forced them inside. She told the kids about the importance of sports and remaining active. "[W]e want to show kids just like you that there are all kinds of ways to be active, and that being active is also a whole lot of fun. So a lot of what we do while there are soccer drills and things like that going on, we're doing a lot of playing around and laughing, and realizing that that's what being healthy is about. It's not always work; most of the time it's a lot of fun." She left admonishing the children to "eat your vegetables." A sentiment that was echoed by star soccer player Beckham who when asked by one child was his favorite food is he hesitated only briefly and answered, carrots! « Previous entryThe first family is worth how much? He sure does like being a celebrity, too bad he doesn't like leadership or responsibility. obummer like to LOOK like he is leading...a leader. However, there is nothing in his past that would indicate he is a leader...he is a soap salesman... the results speak for themselves. It is really a shame that the entire championship team was not invited to this appearance. Who is leading then Sponge-Bob?? Will you please tell us that?? You are such an anti-Obama hater until it just won't go!! You're a pathetic piece of work, veteran!! They can't debate issues on merit so that's all they have left. It takes thought and effort to actually presuade so they simply restort to demonizing. Our problem is we don't have a leader...we have a radical community organizer..law lecturer(those who can do and those who can't teach) narcissist as president of the free world...and the mess here and overseas prove it. Hi Liz, just heard tonight that Romney is leading the President in a New York Times poll in 3 categories: overall, women and independents... of course it is only May... lets hope both parties stick to the issues and not bash each other and their supporters! I am proud of the LA Galaxy showing up for this event dressed in dark suits and tie. Great representatives for soccer in the USA. Also proud that they stayed to give a clinic for kids. First Class LA Galaxy. What does any of this have to do with honoring a soccer team? Both sides like to gripe over nothing. same ol negitive stuff . Why bother commenting at all if all you do is complaine. Artical about soccor team anyway. you only say this because you know barry is finished and the truth hurts...and sometimes a little pain is good. Is Obama aware that the Heat DID NOT win the NBA championship? Sorry Beckham Carrots? I dont buy it but for shure the right awenser for the crowd. Looks like he has plenty of time for photo ops. Yeah, I know that GWB did the same, but it is time to get down to work.